If you read my email from the other day, you know I’ve been talking about Intuitive Physical Energy (check it out here) – but I kind of left a cliff hanger there and didn’t tell you much about how I’ve been working with it down here in Costa Rica. What I found is that there is another, until recently, undiscovered way of being intuitive. Many people are grounded in their bodies in a very physical way. They believe only what their five senses tell them. You know who these people are, as we all see them in our lives every day. Then, there are the people I work with who are either tired of being totally grounded to their bodies, or have struggled with being grounded in that way and are seeking instead to open their intuitive connections. These are the sensitives – the people who feel and know about the world around them but many not necessarily understand why they’re so different (I am one of these people). And for more than a decade, I’ve been working with mostly the second group of people to help them learn how to harness their intuition. 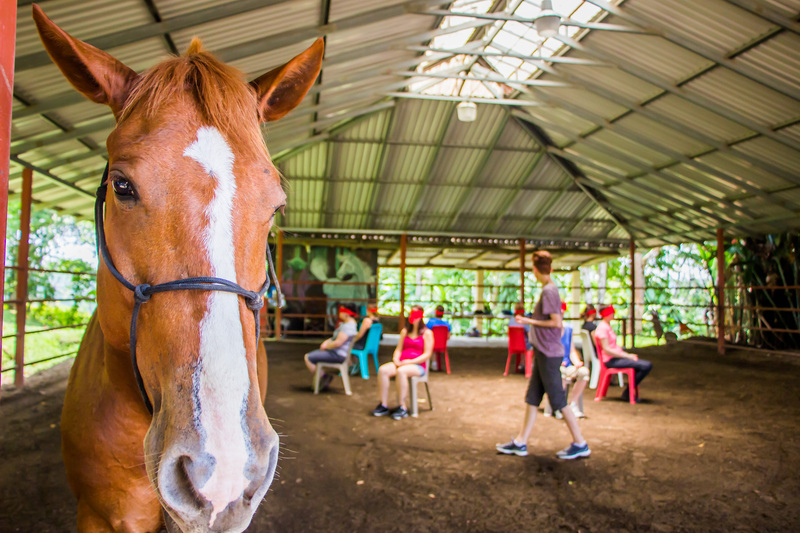 Then, here in Costa Rica, by working with the horses, I discovered a new way of being intuitive. It’s more of a physical body intuition. Think back to how my horse reacted when I tried to leave my body in order to intuitively “check in” on my friend who was feeling ill. My horse felt like he suddenly lost his rider! But as I continued on that horseback ride to the waterfall that day, I began to hone in on this new feeling. To be psychic, I wouldn’t leave my body, I would, in fact, intuitively FEEL my body, be in my body, but not in the same way that I imagined. It was like my intuition and my body were one – and instead of working with one or the other, I became able to focus both together. This meant I was able to intuitively check in on things around me without checking out. And it’s actually one of the biggest lessons that the Horse and Soul participants received as well. How do we be our special psychic selves while still participating fully in the 3D world? The horses had the answer! I’m so excited about this, I’m already incorporating it into upcoming workshops (specifically the one coming up at Omega) because I feel it’s a real missing element of being intuitive. So many of us who are sensitive/intuitive/psychic are so overwhelmed by how challenging it can be to be IN the world, that we tend to choose psychic presence over participation. But with this new way of using intuition, there’s now a much better way to navigate your sensitivities – and it takes energy management up to a whole new level! My name is Susan and I enjoy your emails very much. I would like to join your Be open group, but I’m limited by computer access and data plan. Well I’m making changes in my life you may just see me there one of these days. It seems ironic to me that you all work to be more psychic and I have spent the last twenty years trying to stop it. I had no boundrys and felt everything from everyone and everything. I thought I was crazy. I have learned not to be so sensitive using blocks, shields and emotional clearing. My intention now is to be more knowing ( intuitive) without the rollercoaster ride. I don’t think I leave my body to get info when I do healing work. I do long distance healing. Being a long haul truck driver I didn’t have many face to face encounters. So that was how I connected with people. I just think about someone and then scan my body for sensations. I would focus on those until the energy shifted or lightened. I did this while driving so I had to be present. I just let it happen. I ran into a lot of this unexpectedly on the highway at crash sites. It was very draining until I learned to stop doing that. I have since learned “to me, not through me'” and let go of the need to direct the process. Physical Intuitive Energy Part 1 Animal Lessons here today!